A vehicle struck and fatally injured a 4-year-old boy in front of a North County apartment complex Friday. 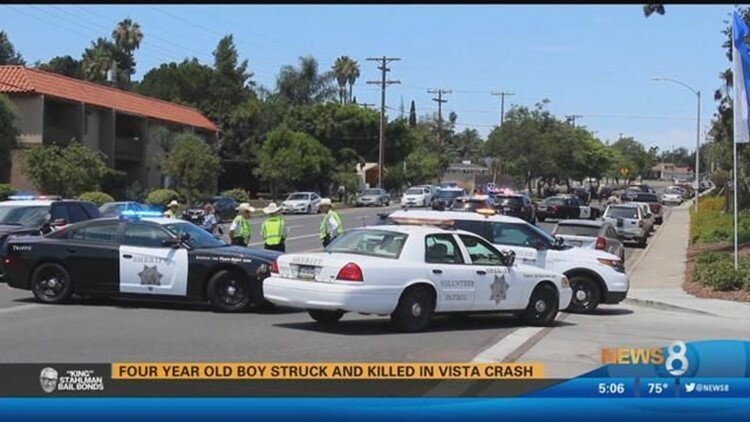 VISTA (CNS) - A vehicle struck and fatally injured a 4-year-old boy in front of a North County apartment complex Friday. The toddler was trying to cross the street mid-block in the 800 block of East Bobier Drive in Vista when the westbound 2005 Honda CR-V hit him about 10:45 a.m., according to sheriff's officials. Medics airlifted the victim to Rady Children's Hospital in San Diego, where he was pronounced dead. The driver of the SUV, a 66-year-old woman, was not believed to have been under the influence of alcohol or drugs at the time of the accident, Deputy Sean Gallagher said.